Hey everyone! Welcome to Satur-YAY! We're celebrating the weekend by getting our craft on! There's no better way to spend the weekend (in my humble opinion). 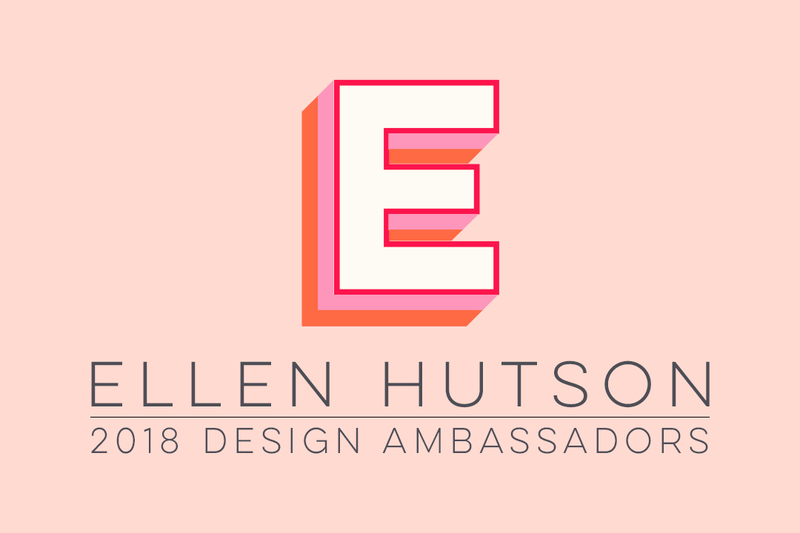 I can't wait to see what you're making this weekend, so be sure to share it using #EllenHutsonSaturYAY! Today I'll be using the Sweet Sprinkles United We Flourish stamp and die set to create a sweet card that could really be used for any occasion! I love the feminine feel of the cupcake combined with a little bit of kraft card stock to add a little bit of rustic charm. I'll be using my Prismacolor Colored Pencils to add a little bit of shading to this solid stamped image. You'll see how this quick and easy step can really add depth and dimension to a solid stamped image. You can also use this technique to add shading to a colored image. If you don't have the right combination of markers to create light and dark on your image, try using colored pencils over the top of your coloring to add depth and dimension instead! Here are a couple of tips for adding shading to your stamped and colored images. There's no need for your colored pencil to be a specific or exact shade. Just choose a pencil that is slightly darker than the stamped or colored image you want to add shading to. There's no exact science...and that's what makes it so darn easy! In order to created the illusion that you've used multiple colors, start with a heavier hand to lay down more color in the areas you want darkest. Lighten your pressure as you move to the lighter shade to vary the color. This will make it look like you used 3 or 4 colors. You can add highlights to an image by adding a touch of white colored pencil. This one pencil in your stash can go a long way in adding lighter highlights to all of your images. Don't be afraid to play. Often times, when we are willing to experiment with new things, we find unexpected discoveries along the way. I've also done a little de-bossing using the little scattered hearts included in the Sweet Sprinkles stamp and die set. It's a fun and unexpected way to use your dies and get more out of them. Be sure to check out today's video tutorial. I'll be walking you through the creation of today's card and give you a few more tips and tricks (and maybe giggles) along the way. Thanks for stopping by today. I hope you've enjoyed today's project. I can't wait to see what you're creating on this fabulous Satur-YAY! Be sure to share your projects with me! You can watch this video in HD on our YouTube channel by clicking HERE. Don't forget to subscribe and share it with a friend! Long time, no hello! I've been down with flu, followed by bronchitis/laryngitis. ACK! Today I'm sharing an interactive card inspired by my dear friend Jennifer McGuire! When I first saw Avery Elle's "Splash" set, I was smitten (like, ran-into-a-light-pole-SMITTEN!) and immediately thought, "I just GOTTA make a floating image card with this AWESOME set! Avery Elle Clear Stamps, Splash! We are so delighted to welcome our new friend Therese Calvird to The Classroom today! Therese's expert coloring makes us so happy! We are positively thrilled that she is here to share a coloring video with us!!! You can check out more of Therese's gorgeous work on her blog, Lost In Paper. And while you are there soaking up the beauty, leave Therese a little comment love. Therese will be drawing the name of one lucky winner to receive a $50 coupon to our store! Thank you so much for sharing your talent with us Therese! We hope you come back soon! What an absolute pleasure it is to be here at the Ellen Hutson Classroom today! I seriously had so much fun playing with the recent new release products that I couldn’t just stop at one card, so I have two to share with you and a video showing the process. Today is all about adding some easy shading to a solid image using Prismacolor Pencils and these stamp sets are perfect for this! For my first card I used the Snailed It Stamp Set and I created my own little background scene before adding the star of the show, the snail. I kept the shading very simple in this design to show that anyone can do this! But if you wanted, it would be easy to build on this and add so much more depth and detail. My second card takes the technique just a little bit further. I stamped a simple bouquet with the Thistle Stamp Set and used Prismacolor Pencils to add some shading but also to add some extra details to the flower stems and to the blooms. To add a little extra something to the clean and simple design I did use a Wonky Stitched Oval die from My Favorite Things to add an embossed border around the design. Pencil tips for Copic colorists! Hello, coloring friends! I'm Sandy Allnock...here with a quick little tip to help with your Copic coloring that you just might not have thought about before. I'm often surprised when I say something in a video that appears, to me, to be...well, a no-brainer. That's likely a symptom of being an obsessive colorist - I assume it's a little tip others of course know, but that's not always the case! This might be one of those - and it's using colored pencils along with your Copic markers. Check out my video coloring these sweet kitties from Elizabeth Craft Designs...watch it below or HERE on YouTube! Link: Watch in HD on our YouTube Channel HERE! Thanks for sharing some comment love and a thumbs up with Sandy there and be certain to subscribe to our channel for other fantastic videos! coat a Copic area to push the color to be more blue, more pink, etc. Good Wednesday morning and welcome to the CLASSroom. Hey, look at me! No dies anywhere to be seen. For my project today I challenged myself to create a freehand tree with watercolor pencils. I searched on Google and found How to Paint a Tree with Watercolor Pencils on the Paint Academy You Tube channel. I was intrigued and thought I would give it a try. I was fearful about doing this tutorial for the CLASSroom because I have never been good with colored pencils. I figured you wouldn’t mind following along with me to see what could come up with. My tree is nowhere as detailed as the tree in the video but I have to admit I was more than surprised that it was even presentable. I couldn’t quite figure out how to get clear leaf details so I used a “scribble technique”. LOL! Begin by drawing in a faint tree trunk and then applying the lightest green color to form the outline of the tree. Apply a medium green to fill in spaces. Apply a darker green to fill in. Choose a dark blue green and fill in to create more shading and depth. Finish the darker shading using a purple pencil. Fill in the blank spaces of the tree using a bright yellow/green pencil. Apply more the light color on the right side of the tree. Fill in a portion of the trunk using a brown pencil. Sketch in a few branches in the lighter sections of the tree using the brown pencil. Apply dark violet to create the shady side of the trunk. Apply dark yellow to fill in the trunk. Using a medium wet brush I lightly brushed over the tree image to wet the color to create a painted appearance. My final step was to scribble green pencil on the ground area. Looking back I probably should have tried to add a bit of shadow on the ground area on the darker side of the tree. Maybe I’ll do be next try. I finished by layering my picture on brown and green cardstock and adding Julie’s “no words” sentiment from the Essentials by Ellen Lovely set. Thanks for joining me today and I hope you have a wonderful day. Pencil crayons (the Canadian in me still refers to them this way, I just can't help myself- LOL! ), also better known as colored pencils, were the first medium I learned to color with as a young child and one I still favor. The ability to control the amount of color dispersed on the paper, create various textures and add depth over my Copic colored images always draws me back to these beautiful little cylinders of color. One of the most requested subjects on our Facebook page is coloring information. Tomorrow begins a week-long series of projects our designers have created for you, using a variety of colored pencils! Today I am sharing some basic knowledge I have developed over the year that I hope gives you a better understanding of colored pencils. Once again I have to make a disclaimer here - this is my opinion and experience - it is in no way scientific, but I hope it helps guide you as you learn more about colored pencils. Colored pencils are constructed of a narrow, pigmented core encased in a wooden cylindrical case. Typical cores are wax-based, oil-based and water-soluble materials. They each contain varying proportions of pigments, additives, and binding agents. Colored pencils vary greatly in terms of quality, usability, lightfastness of the pigments, and durability of the core. Q. What should I look for when purchasing my first colored pencils? A. You always want to look for a colored pencil that has the core of color centered in the pencils. If they are warped or have an off-centered core the core will break more easily and you will constantly be sharpening your pencil away to create a point you can use for coloring. Q. What is the best paper to use? Finish -the roughness or texture of the surface. I like a paper with a little tooth because it allows for a variety of techniques. Rougher paper allows for texture to naturally show through, whereas smoother paper is better for highly detailed works where intricacy is more important than depth of layers of color. Weight - this is not the literal weight of the paper, but rather thickness of the paper. For many layers, a higher-weight material will be more suitable; while other techniques, such as rubbings, a lower weight would allow for more texture to appear. There are other characteristics of paper that one can consider such as fiber, sizing, and dimension, but for a beginner these first two are the most important to consider. Q. Which colored pencils are the best? A. Yet again, this is an impossible question to answer because it all comes down to personal preference, budget and skill level. The most popular colored pencil cores are wax-based, oil-based and water-soluble. Oil-based varieties generally have some wax in them but will be of high oil content. There are various other additives included in the core that give each pencil a unique color, texture and characteristics. Many people enjoy using both varieties due to their varying properties and the way they lay down color. Wax-based colored pencils are by far the most popular. They are less expensive and more easily found. They come in a wide range of colors, but they can be less durable since the core is softer. They are easy to blend and add depth and texture to your images. Oil-based pencils are far more specialized and therefore costly. The color application can also be quite unique. The harder core means that they may be a bit more durable and sharpening them to a fine point makes these better for intricate areas. As well, wax bloom is not a potential problem. However, the output of these colors can be on the light side, so additional passes may be necessary to achieve the desired look. They also can smear somewhat easily so precaution needs to be taken. Water-soluble pencils are a unique medium for creating art. They combine coloring with painting in a manner that no other medium can replicate, BUT they can be also be used dry with beautiful results! They are similar to colored pencils but behave differently when water is added because the pigment is held with a water-soluble binder rather than a waxy or oil-based binder. These will need a feature all their own, but we will be including them in our instructional series this week, so stay tuned! Today I am going to focus on two varieties of colored pencils and share a comparison between Prismacolor Premier Colored Pencils and Spectrum Noir Colourblend Colored Pencils. Can be used for sketching, illustration, adding depth and definition to markers and mixed media work. A versatile, hybrid colored pencil with a unique formula, makes Spectrum Noirs a great choice for transition from beginner to a more serious artist. Prismacolor Premier Colored Pencils - we are adding these to our store due to many requests, please watch for more arrivals in the coming weeks! Lightfast - a large portion of colors are not lightfast, but a spray fixative will prevent wax bloom on your finished work and help protect against UV damage. For a complete listing of the lightfast quality of each Prismacolor Premier pencil refer to this chart that Prismacolor has provided. Can be used for sketching, illustration, adding depth and definition to markers and mixed media work. These pencils are so soft and velvety that almost anyone can be successful with them. The top row shows the results of the Spectrum Noir Colourblend Pencils using the techniques above and the bottom row is the results of the Prismacolor Premier Colored Pencils. Conclusion: The Spectrum Noir seemed to have a "softer" feel to them as I colored. This seemed to put the color down in a quicker manner with less option to get distinct details between colors. I found that I could get a more vivid look with the Prismacolor colored pencils. It appears from an uneducated eye that the Prismacolor pencils may have more pigment in them based on how the white laid down on the black cardstock. The "feel" as I colored was different between the two brands and I can see how artists may prefer one over the other for different looks. Even though they have a different feel when you color you can mix the two brands of colored pencils without any problems. Pencil extender - attach to the pencil, so it can be held comfortably when sharpened to a stub. A secret of pencil work - don't go hard! Go light to medium until you know where you want your darks. You can change your mind easier and lighten it with an eraser if you go lightly! Workable Fixative - adds tooth back to your paper after your paper has been burnished. This allows you to add additional layers of color. When you sharpen your pencils, it is best not to sharpen the pencils to a long fine point. The lead is so soft and brittle that you are more likely to have the tip break when sharpened this way. Rather use a piece of sandpaper to sharpen the tip to a fine point rather than sharpening the whole pencil – this will allow you to maximize the pigment in each pencil core. When your pencils get too short to hold comfortably in your hand use a pencil extender to allow for ease and control when coloring. Use your heat tool to blow warm air over the surface of your colored work if a wax bloom occurs. A fixative or varnish will ensure that wax bloom will never recur. Hand sharpen colored pencils for best results or invest in a high quality electric sharpener. burnishing - using a light-colored pencil or metal object with heavy pressure and applying it over layered colors. It makes the colors look brighter, sometimes lighter and can give an image a polished or reflective look. color pencil - a pencil containing a wax, oil or water-based bound pigment as its "lead". They are semi-opaque accept for white, cream and grey. cross-hatching - a technique used in coloring, where patterns of lines in different directions may be layered to create tones and new colors. Colors can be mixed by crosshatching. fixative - a protective spray you can apply to color pencil work. It prevents wax bloom and can be used when color won't adhere to the surface of the paper any longer. Fixative will add "tooth" back to your paper so that you can add additional color layers. pigment - the substance that absorbs light, producing (reflecting) the same color as the pigment; the pencil color to be applied, either wax or oil-based. value - the shade (darkness) or tint (lightness) of a color. Also, called brightness, lightness, shade and tone. wax bloom - is a buildup of wax from wax based pencils, which creates a whitish haze on the surface of the paper. It forms especially when heavily worked, as a layer of the wax medium rises to the surface. It tends to appear once the work has been sitting for a week or two. To prevent wax bloom, give the drawing a couple of layers of fixative or heat with an embossing gun.